I got into an interesting discussion with some friends on FaceBook the other day about what Americans can reasonably expect from retirement. It made me think about what my own expectations had been and I realized that I had never really had many. Oh, I saved a lot of money in defined contribution plans over the years, but not because I was thinking about the future. I had a high-paying career and the tax deferrals were instant gratification. I knew down deep that I would have to pay those taxes someday, that they were merely deferred and not avoided, but I didn't give that much thought. I was interested in the current year's tax savings. Surely everyone knows by now that a large majority of Americans under-save for retirement. Baby Boomers haven't saved enough and they get most of the venom from the press, but younger cohorts are in even worse shape. How badly prepared are we? "EBRI’s updated 2012 Retirement Security Projection Model® finds that for Early Baby Boomers (individuals born between 1948–1954), Late Baby Boomers (born between 1955–1964) and Generation Xers (born between 1965–1974), roughly 44 percent of the simulated lifepaths were projected to lack adequate retirement income for basic retirement expenses plus uninsured health care costs." How do we compare to the rest of the world? 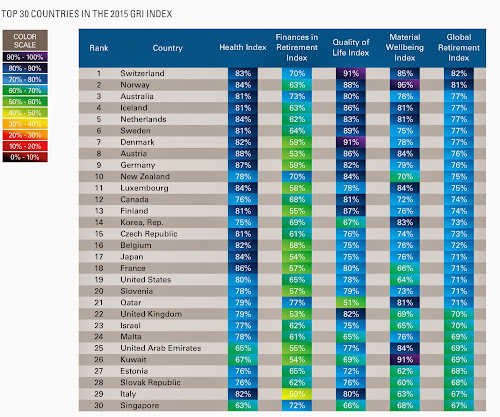 Natixi Global Asset Management produces a ranking of retiree welfare by country (PDF). In 2015, they rank U.S. retirees 19th in the world, slightly worse than France, slightly better than Slovenia, and four rungs below the Czech Republic. At least we don't have to fund Japan's retirements, with life expectancies of 84 years, let alone Monaco's nearly 90. So, the problem that has evolved, for both Baby Boomers and younger cohorts, is that advances in medicine have extended our life expectancies significantly since World War II (though not as far as Portugal's, let alone Monaco's) and that has significantly increased the possible cost of retirement. Unfortunately, longer life spans increase the number of years at the end of our lives, while our earning years still end around age 65. We have the same length careers to fund potentially much longer lives. For someone who lives to 95, that means perhaps 70 years of adulthood will have to be funded by about 40 years of working career. We get some help from Social Security retirement benefits, a few of us have pensions, and we can leverage time and our investments if we start saving early. But that's still a pretty tall order. That brings me around to how to think about retirement savings. We shouldn't think about retirement savings as this year's tax break, as they were marketed to Baby Boomers, or as a way to make our retirement years a little more golden. We should think about retirement savings as transferring some of the wealth from those 40 working years to fund the last 30 after retirement. It isn't fun to think about the fact that in addition to supporting our families before we retire – which probably seems like an enormous challenge on its own – we need to earn enough to also support ourselves and our spouses for what could be a very long retirement. If I were giving my twenty-something children retirement saving advice, that's what I would tell them. Save like you understand that the money you earn today has to pay the bills today and the bills after you retire. Because it does. I would also tell them that funding a decent retirement in the U.S. is an extreme challenge that requires sacrifice while they are working and a great deal of good luck throughout their lifetimes. Many households simply won't earn that much, or be that lucky, and that is the reality that ERBI is reporting. It's not the prettiest picture, and it's one you can't wish away. I agree, but I did not suggest that these sources be used for retirement planning. Your link looks like a great resource for anyone seriously interested in international life expectancy, but like you, I don't see the relevance to actually planning a retirement in the U.S. The CIA table was provided as background information. I did glance at the book at your link. You seem to be familiar with international life expectancies, so maybe you can answer a question for me. Doesn't Figure 2-1 at your link, a scatterplot of GDP versus life expectancy at age 50 for 2005 show pretty much the same ranking for the U.S. as the CIA ranking of life expectancy at birth? I count 21 dots above the U.S. dot, which would put us at 22 instead of 19. Sorry to take so long to reply. The CIA ranking of life expectancy at birth has the US at 49th, not 19th, so in fact we are doing relatively better at living longer once we have gotten past infancy. The elephant in the room is that child poverty (i.e., poverty in young households with children) is a far more serious problem than elderly poverty in the USA. Our safety net for the elderly is relatively much better than our safety net for children. OK, so I now think you and I are in sync. 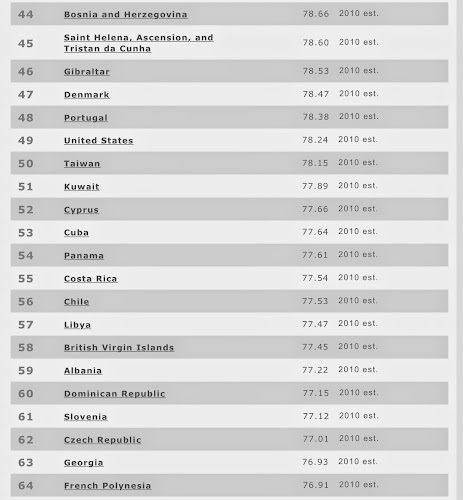 I agree that childhood mortality in our country is a disgrace, and that American life expectancy from birth is extremely poor compared to other countries (49th). My disagreement is with your initial statement that "Tables of life expectancy distributions conditional on having some reasonable adult age would be more relevant [than the one I provided]." The table I provided in the post is, in fact, based on the conditional probability of, as you say, "reaching older ages." 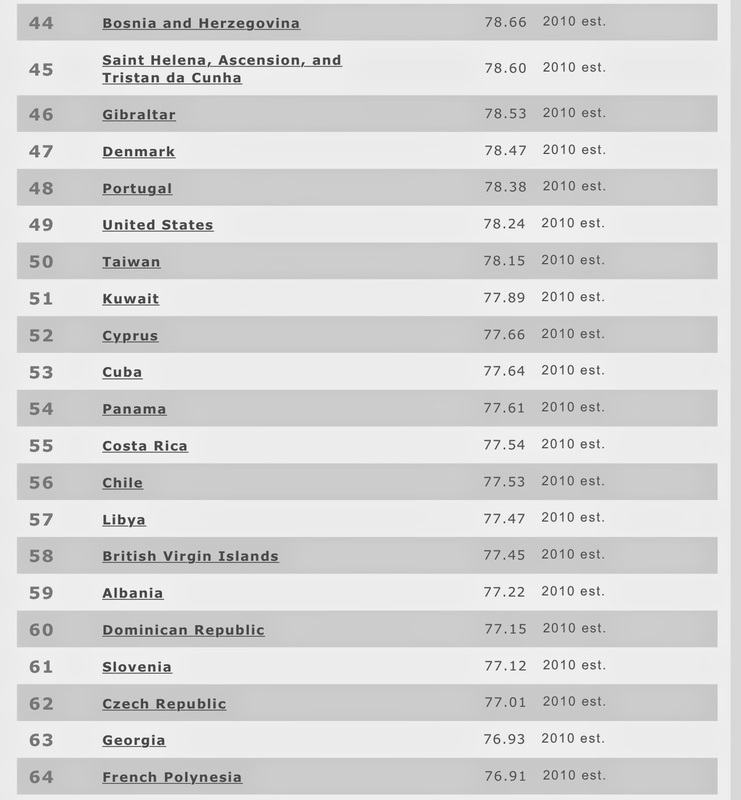 As your link confirms, had I included infant mortality, we would rank 49th in the world, not 19th. I also disagree, as a result, with your comment that the data I provided is "pretty much irrelevant to retirement planning." It is highly relevant to retirement, though not granular enough to be used for an individual's retirement plan, but that isn't something that I suggested. Thanks for reading my posts and taking the time to share some important information. You're welcome! It's my favorite part of the blog.